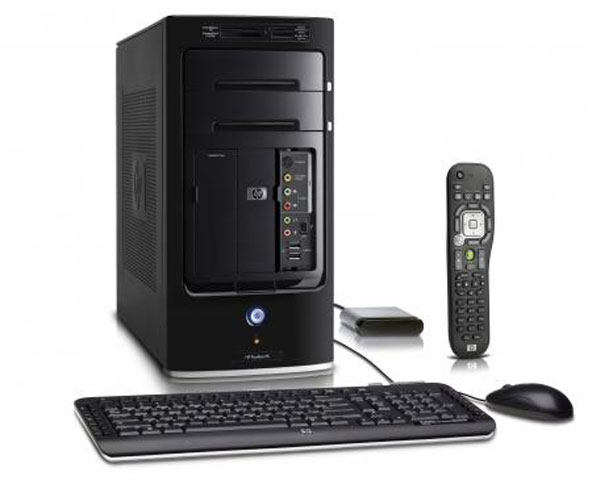 An HP Media Center PC with more bang for the buck than you’ll ever get putting the same thing together yourself for this price. I picked it up at Circuit City for $899. Did I mention that it nearly doubles the stats of the one I’ve had in my cart at NewEgg for 6 months? Oh...well, it does. I’ve been in the PC market for half a year, never even bothering to look into shelf models because I’ve just had bad luck with them in the past. Packard Bell back in the day, Compaq in high school... The third box I built myself and it was a breeze. I’ve...had that computer since 2003. I’ve had an HP for work for a little over two years, and I’ve had great luck with it. I think that’s why I wasn’t very hesitant to give this bad boy a try. In my cart sat a Core2 Duo, 2 gigs of RAM, a 512MB nVidia card, and the rest of the components necessary for a home-built PC minus an OS and a hard drive. I figured I’d continue to utilize my copy of XP Pro and the 320GB IDE drive I bought a couple months back. I was pretty astounded to find that a PC just sitting on Circuit’s shelves, barely advertised, with nearly twice the stats (and then some) of the machine I had in my virtual basket in a virtual store in this virtual world we all live in. Windows 7 blows the socks off of Vista. It’s got everything Vista does, plus faster. Free beta is open now, just google it. Not dissing Vista, but Macs have nothing on 7.